Todd Selby takes photos of the creative elite in their creative spaces. He started his website in 2008 and his first book was published in May of this year. The entire book is available to see online, only, until Friday 12th of November at 9am (NYC time) or you could order it from here. It features photographs of some very interesting people and spaces, and I love the felt tip interviews with pictures at the end of each feature. 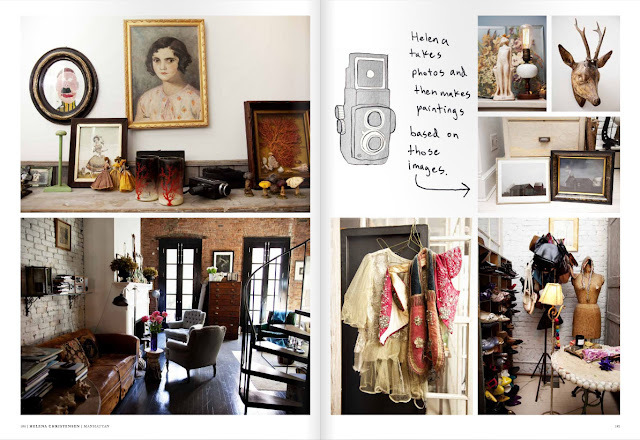 Here's a sneak peek from the book featuring the home of one of my favourite ladies; Helena Christensen. I just sent the link around my work to get them to take a sneak peak before 2pm (GMT) tomorrow. I am envious of Karl lagerfeld's library. Been meaning to purchase the Selby book since it came out, now added to my Christmas wish list! Just knew Helena Christensen would have a beautifully quirky home!